I was reading an article in the Daily Mail about good luck and serendipity. This got me thinking as to how similar coincidences and synchronicity are to serendipity. My dictionary quotes serendipity as: The faculty of making fortunate discoveries by accident. Which, in a way, is similar to coincidences - though they may not always be fortunate happenings. "Serendipity smiles upon people who have a more relaxed approach to life. They have clarified their long-term goals, but don't worry too much about the details. Once they've pinpointed the ultimate goal, they believe there are many ways to get there. This requires openness to life's surprising twists and turns as well as cognitive and behavioural flexibility. An open person heads to the dog park thinking he might encounter a new friend, business partner or romantic interest. A closed person sees only dog owners. You can increase your opportunities for luck by having a large network of friends and by being flexible. Take varied routes to work or go to different places for coffee rather than 'the usual'. Exploring new territory naturally increases good fortune. And try to keep your mood positive. Anxiety gives us tunnel vision; while we are focusing on a potential danger we miss extraneous, but potentially beneficial, information." Now isn't that virtually a recipe for also experiencing more meaningful coincidences? 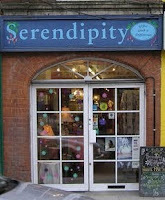 I like that: serendipity being the lighter, fun side - thanks. Must say I wasn't too sure what serendipity was but if it's 'fun' count me in. I like the article. Good article. I like terri's take, too. Serendipity as the lighter, fun version.